The C2V is a tracked, armored vehicle designed to provide an automated tactical command post for mobile armored operations. At the Corps and division, the C2V will be the tactical command post (TAC), while at the brigade and battalion, it will be the tactical operations center (TOC). The C2V platform is designed to provide information superiority directly supporting the dominant manuever force. The C2V will provide the maneuver battalion staff with the same degree of speed and mobility as that of the Abrams Tank and Bradley Fighting Vehicle (BFV). The staff housed within will be able to perform their duties while the vehicle is moving and stationary during highly mobile combat operations. The C2V will house the Army Battle Command System (ABCS) Common Hardware and Software (CHS), its approved and validated communications suite, and other approved electronic devices such as position-navigation equipment. The C2V will capitalize on the experience gained and technology developed for the M1068 Standard Integrated Command Post System (a variation of the M577). The C2V will normally operate where it can best control the fires and maneuver of Abrams tanks, Bradley Fighting Vehicles, and other mounted combat systems. It will be refueled and resupplied using the same techniques as other tracked combat vehicles. The C2V will use automotive/armor technology and integrate communication and automation systems that have already been fielded. The C2V maintenance and repair will follow the procedure and standards already established for mechanized infantry and armored forces. The C2V chassis, automotive components, computers, and associated communications will share commonality with the other systems in the unit where it operates. 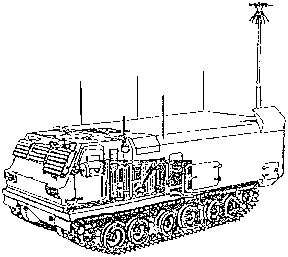 With a capacity for 4 ATCCS workstations and the capability to receive and send data to the Battle Command Vehicle, as well as linking to the Army Tactical Command & Control System (ATCCS), the C2V provides the ability to support command and control functions during mobile operations with performance objectives and growth potential for full on-the-move operations capability. It will provide mobility, power, intra-inter vehicular data connectivity, electrical power control and distribution from an on-board primary power unit and mounting provisions for onboard and ancillary equipment. The intercom system will provide each workstation with the ability to transmit and receive voice and data to all other workstations within the same C2V and to workstations in other C2Vs within the same command post in the following modes: point to point, group, and communications. The intercom system will also provide the capability to interface with the Army standard vehicular intercom system used in other type of staff vehicles through a LAN. The C2V will replace the current tracked command post, the M577A2. Mounted on a modified M993 Multiple Rocket Launcher System (MLRS) chassis, it will be powered by the same 600 horsepower drive train currently used in the Bradley. The C2V is intended to be survivable against nuclear, biological, and chemical threats, and electromagnetic environmental effects. It has a requirement for protection against 7.62mm ball ammunition at 200 meters, and against a 155mm high explosive artillery burst at 30 meters. The C2V program is under oversight for both Operational Test and Evaluation and Live Fire Test and Evaluation. Its requirements have been published by the Army's combat developer, the Training and Doctrine Command. The C2V program has two materiel developers. The Program Executive Officer (PEO) Command, Control and Communications Systems (C3S), (responsible for the hardware and software for the computer workstations inside the vehicle), and the PEO, Armored Systems Modernization is responsible for the vehicle itself, including the local area network wiring inside. In March 1993, the C2V program reached the Milestone I decision point. It reached the Milestone II decision point in December 1993. From July through August 1995, the Army's Operational Test and Evaluation Command (OPTEC) conducted a phased Limited Users Test (LUT) on the C2V. This was the first operational test of the vehicle. In July 1996, OSD approved the Live Fire Strategy in the TEMP, but specified that the Army should consider the inclusion of an explosively formed penetrator shot. The test was completed in early 1996, and it identified one area needing redesigned ballistic protection. The Army System Acquisition Review Council (ASARC) made a Low Rate Initial Production decision in September 1996 based on the results of the LUT. The C2V participated in the Army's Task Force XXI Advanced Warfighting Experiment (AWE) in March 1997, with five vehicles used in the Brigade TAC and one maneuver battalion TOC. The Milestone III decision is scheduled for July 1999, after an Initial Operational Test and Evaluation (IOT&E). There was no operational test activity conducted with the C2V in 1997. Five vehicles participated in the TF XXI AWE. One was the brigade TAC, while the other four were in the mechanized infantry battalion TOC. The next scheduled test event for the C2V program is the Initial Operational Tests and Evaluation (IOT&E) scheduled for 1998. This test will be focused on the effectiveness and suitability of the C2V system to provide integrated command and control operations from corps to battalion in mounted combat. A total of 12 C2Vs will be tested during the IOT&E. There was no formal evaluation of the C2V associated with the TF XXI AWE, since it was an experiment, and not an operational test. Feedback from the Army indicated that the C2V was employed in a similar manner to its predecessor, the M577A2, during the AWE, rather than employed on the move i.e. it was simply used as a shelter with a tent extension, and did not demonstrate any of its unique capabilities. The vulnerability of the C2V will not be further assessed until the completion of a full-up system test to be conducted in mid-1998. In that test also, the Army plans to assess the mobility of the C2V with regard as to whether command, control, and communications will be conducted actually on the move or conducted when it is stopped. There are still concerns as to what communications-electronics will be installed, operated, and maintained in the vehicle and what soldiers will operate the vehicle and its equipment. While the Army has designed a vehicle with enough installation equipment to accommodate most communications-electronics configurations, there are concerns that a specific configuration be identified and integrated into to vehicle to support highly mobile combat operations.